Thomas Jefferson was the voice of the American Revolution, the author of the Declaration of Independence, the founder of the University of Virginia, and the third president of the United States. But he was also a man famously ruled as much by his heart as by his head. He was a man who loved a number of noteworthy women, all of whom play a role in our new book about the life of his eldest daughter, Patsy. As a young man just starting out in life, Jefferson apparently developed a crush on Betsy Walker, wife of his best friend and college classmate, John Walker of Belvoir. In 1768, Walker asked his single friend and neighbor to watch over his wife and infant daughter while he was away on the business of negotiating a treaty with the Indians. The details of what happened between Jefferson and Betsy have not survived, but in the 1790s she apparently confessed that something had happened to Walker, who waited another decade to confront Jefferson. In an 1805 letter, Jefferson admitted to improper advances made forty years earlier toward Betsy and apologized in order to avoid a duel and a political scandal. The vivacious and witty Martha bore Jefferson six children, only two of whom survived to adulthood. She died in childbirth–extracting a promise from him never to marry again. A promise the devoted and heartbroken Jefferson made and never broke. The loss put Jefferson into what might be characterized as a suicidal depression. He would carry with him all his life the last words she wrote and a lock of her hair. When Jefferson served as the United States Minister to France in the immediate aftermath of the Revolutionary War, he was still a grieving widower who managed to keep himself free of romantic entanglements that might have tempted him to break his vow to his dead wife never to remarry. But that did not stop him from falling in love with a married woman. 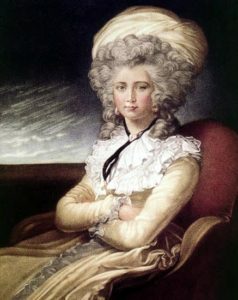 Maria Cosway was a beautiful Italian painter who shared his love of art and music. She was married to a adulterous man nearly twenty years her senior–who forbade her from painting. And her brooding self-portrait is said to have been painted in protest. It was fellow artist John Trumbull who apparently introduced her to Jefferson in those heady days in Paris on the eve of the French Revolution. And it appears that Thomas Jefferson was instantly smitten. He squired Maria to the Palais Royale, to the opera, on picnics and sightseeing tours. And in the midst of what many scholars believe to have been a heated affair, Jefferson wrote his most famous love letter, “A Dialog of the Head versus the Heart.” The relationship eventually ended–badly. Jefferson stopped writing to Maria for a time and when the letters resumed, his head had won the battle. Sally Hemings became publicly linked to Thomas Jefferson in 1802 when newspaperman James Callendar published the allegation that she was Jefferson’s “concubine”* and had borne him a number of children. But the truth is that Sally Hemings had been a part of Jefferson’s world for almost her whole life. Jefferson’s wife, Martha, inherited Sally and a number of other enslaved members of the Hemings family, and Sally came to live at Monticello about 1776. Though the newspaper had many of the details wrong and Jefferson’s policy was never to speak on the matter, the Thomas Jefferson Foundation and most historians now believe that Callendar was correct on the essential charge. Jefferson’s relationship with Sally probably started in 1787 or 1788 while she was working as his youngest daughter’s maid in Paris, where Jefferson served as the American Minister to France. Though French law offered Sally the opportunity to remain there as a free person, she was possibly pregnant with their first child at that time and chose instead to return to Monticello. Jefferson apparently negotiated with her intensely and promised her a good life at Monticello and to free any children they had. Years later, Sally’s descendants recounted that she made this decision because Jefferson “loved her dearly.” Together, they are alleged to have had seven children together, four of whom lived to adulthood and all of whom went free. After nearly forty-years, after Jefferson died, Sally collected a few of his belongings as keepsakes (his spectacles, his shoe buckles, and his inkwell) and left Monticello. She lived as a free person in nearby Charlottesville and was listed as a free person in the 1830 census. Jefferson’s eldest surviving daughter, the heroine of America’s First Daughter, was his “constant companion” from the moment her mother died until the end of his life. Though theirs was not a romantic love, it was so extraordinarily intimate a relationship that it might count as the great love of his life. Patsy looked like her father, shared his even temperament, and bore the brunt of the sacrifices made in the name of his political career and pursuit of building a new nation. Intelligent and emotionally tough, Patsy always put her father above every other relationship in her life–including her own marriage. Theirs was an unusual father-daughter connection that lasted beyond the grave, for when Jefferson died, it was his daughter who edited his papers and shaped his legacy for prosperity. *According to scholar Annette Gordon-Reed, the common usage of the word “concubine” meant “substitute wife” at the time Sally’s son Madison used it to describe his mother’s relationship with Jefferson. 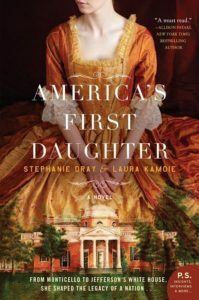 ← Win a copy of America’s First Daughter for Father’s Day!